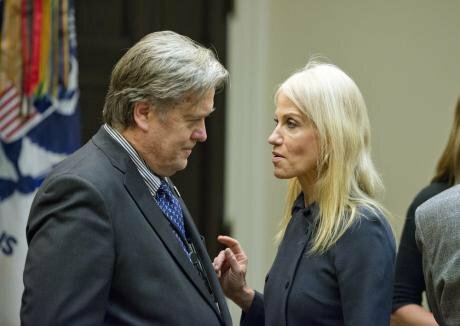 Bannon, "éminence grise", with Kellyanne Conway as Trump meets with cybersecurity experts. Ron Sachs/DPA/PA Images. All rights reserved.When Kellyanne Conway contested the attendance figures at Donald Trump’s inauguration with what she called “alternative facts” at a Meet the Press event on January 22, 2017, it joined Trump’s use of conspiracy theories and complaints about 'fake news' to create a constellation of disinformation that has become his modus operandi. However, while the idea of 'alternative facts' has been met with a mix of mockery and condemnation I would like to suggest that we shouldn’t dismiss the idea too easily because 'alternative facts' have genuinely important work to do. For this, we need to differentiate between two critiques of facts. The first emerges out of critical sociology and cultural studies, and leads me to contend there is a grain of truth in Trump’s assault on reality. The second emerges from and ultimately merges with the mouth of Trump, leading me to argue that this grain of truth is being used duplicitously to establish authoritarian government in the United States. With regard to the first critique, part of Team Trump’s assault on reality is the perfectly legitimate claim that purveyors of facts, from historians to economists, politicians to media pundits, have used facts to support a specific formation of power. The truth here is that facts do not exist in a vacuum. From critical sociology we have learned that facts are social: what we know to be the case is determined by the direction of our attention, what we find important and what we value. Facts are 'discovered' because society is organized to 'uncover' them in a particular way. If our concerns change, then we uncover different facts, or we produce different facts. In this sense, there are indeed alternative facts. To be clear, this critique of positivism is not to say that we cannot demonstrate or prove something to be the case. It is simply to argue that what we are directed to demonstrate and prove is socially malleable. From Cultural Studies we have also learned that history is not simply a set of events that have happened in the past, but a social process in which we first select the facts we wish to record and then interpret them. In both instances, powerful social interests play an important role in the narrative that sets out 'what happened'. Here, a different set of interests or concerns will reveal alternative historical facts. This is central to the advancement of human rights and to any movement committed to social and political transformation. It is a key aspect of race and gender politics as women and people of colour recover things that happened but have been undocumented or erased by the canonical narrative. A major player in this storytelling has, of course, been the traditional news media, and Trump is also correct that the mainstream media – primarily in print and on television, but now including online sources – has uncritically supported a particular formation of power. He is just completely wrong about his description of that power as “liberal” or “PC”. Where the media has supported such an agenda it has been in favour of marginalized groups who threaten to put a dent in the white, straight, male privilege Trump represents. Here, 'alternative facts' in the historical sense outlined above have been used to promote deferent forms of identity politics and the pursuit of equality, but these have had little effect on the wider socio-economic system that continues to promote staggering levels of inequality. What the mainstream media have really supported is the neoliberal project that has reduced everything to markets, undermined regulation, stagnated wages, introduced risk, precarity and uncertainty, and brought about major economic crises. In all of this the mainstream media has been a significant enabler in the shift from the social democratic advances of the post-war period to the establishment of a corporate-financial oligarchy in which democracy in any real sense is meaningless. In this regard, it is deeply problematic to take some knee-jerk reaction and simply defend mainstream news media as purveyors of truth. But hopefully this attack might jolt them out of their hereto comfortable indifference to the effects of power. The second critique of truth is of a kind with this indifference and brings us to the nature and purpose of Trump’s assault on reality. He certainly does not want to uncover or deploy “alternative facts” as part of a genuinely democratic transformation. Trump’s strategy is rather part of an internecine struggle within the corporate-financial oligarchy as different factions fight for control. Steve Bannon, the architect of this strategy and Trump’s éminence grise, once described himself as “Thomas Cromwell in the house of the Tudors”, a man who enabled a shift of power from the Catholic Church to his master, Henry VIII. In our time, Bannon wants a transnational neoliberal order to give way to belligerent competition amongst national capitalisms, with the US at its head, and all loosely connected and briefly allied in their advocacy of white, Christian power. To achieve this shift from a socially liberal and economically neoliberal centre ground to Trump’s brand of national socialism, the strategy is to challenge and disable any form of oversight. This can be seen in the Executive Orders to end the Environmental Protection Agency, and re-organise the Executive Branch. This can also be seen in the attacks on the judiciary that Trump has set up to be responsible for the next terror attack after legal challenges were made to his Muslim ban. It can also be seen in the attack on the last vestiges of 'red tape' that notionally regulates the banking sector. The rhetoric of “alternative facts” then becomes a specific tactic within this wider strategy that is used to undermine oversight from academics, experts and scientists, especially around climate science, but also around housing, education and foreign policy. Most importantly it is a tactic aimed at stopping oversight by the press, now named “the enemy of the people”, and open up or circumvent media channels for the dissemination of uncontested Trump propaganda. How many angels can dance on the head of a pin? It’s a question that can’t be answered. Facts are, obviously, in the eye of the beholder. You have an obligation to make a compelling case. Caveat emptor. Let the consumer decide what he or she believes or doesn’t believe based on how compelling a case you put forward for your point of view. Aside from the absurd suggestion that we might be able to know how many fantasy figures might dance on the head of a pin, this is the consumer model of truth, now presented as an aesthetic/rhetorical problem rather than an epistemological one. Without oversight, fact checking or filtration by journalists, politicians can now describe the world any way they choose. This tactic is also related to the form of political control that documentary maker, Adam Curtis, earlier called “non-linear warfare”. This is an explicit use of both disinformation (information known to be false, incorrect or partial) and contradictory information (especially using elements from across the political spectrum) to create confusion and disorientation, and hinder judgement and meaning-making by the citizens trying to use the information. We can see this in the "Alt-Right’s" use of Milo Yiannopoulos as their poster boy. His identity as a gay, Jewish man undermines the charge that “Alt-Right” is anti-Semitic and homophobic. This can also be seen in Trump’s funding of HBCUs. How can an administration that puts high levels of funding into historically black colleges and universities be racist? Given Betsy Devos suggested the day before that segregation in education was positive because it provided “school choice” for black people, it is safe to say that a white nationalist government might fund HBCUs in order to encourage voluntary segregation. However, the point is that this tactic allows the Trump administration to promote a racist agenda while making it difficult for the opposition to make that charge stick. It is a form of PSYOPS (psychological operations) deployed by a government on its own people. Interestingly, Adam Curtis traces this tactic back to Putin’s éminence grise, Vladislav Surkov. If this particular version of the critique of facts continues, in the end there will only be the mouth of Trump. In such a world, the work of analytical philosopher Ludwig Wittgenstein will be subject to a little spin. 1 The world is everything that comes from Trump’s mouth. 1.1 The world is the totality of what comes from Trump’s mouth, not of things. 1.11 The world is determined by Trump’s mouth, and this being all that exists. 1.12 For the totality of Trump’s mouth determines both what is the case, and also all what is not the case. 1.13 The extension of Trump’s mouth into illogical space is the world. 1.2 The world divides as Trump’s mouth decrees. But this is only one future. We can and must create another. To do this we need to contest the lies, deception and confusion and resolutely advocate for the alternative facts that did actually take place and do exist, but are elided by power. We must continue to uncover counter truths that challenge dominant narratives and hierarchies. In Foucault’s language, this is a political project rooted in the truly democratic advocacy of subjugated knowledges.